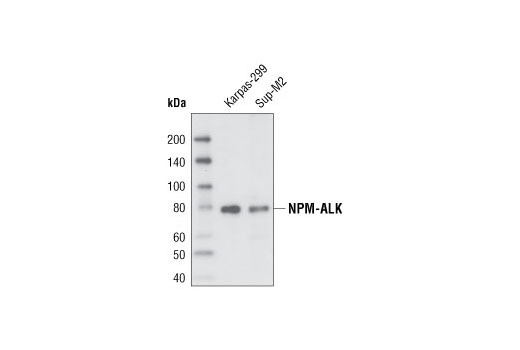 Western blot analysis of extracts from Karpas-299 and Sup-M2 cells using ALK (C26G7) Rabbit mAb. Cell Line Source: Dr Abraham Karpas at the University of Cambridge. ALK (C26G7) Rabbit mAb detects endogenous levels of total ALK protein. This antibody does not cross-react with other family members. Monoclonal antibody is produced by immunizing animals with a recombinant fusion protein surrounding amino acid 1475 of human ALK.